Looking at the weather forecast, we realized that the next day had the potential to be a perfect day. So we meet at seven. When the sun rises above Lake Washington, we already are well on our way out of town. 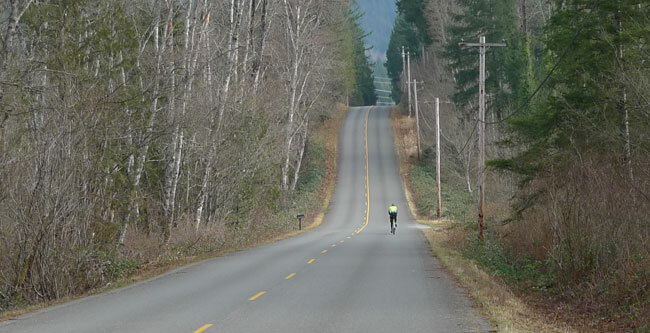 After a stop in Snohomish at a café to warm up (and also the last opportunity to enjoy a tasty croissant), we head into the hills on empty roads. Above, Ryan is on our favorite descent that swoops into an enchanting valley. The frost enhances the beauty of the landscape. Thanks to the short climbs at regular intervals, we do not get cold. 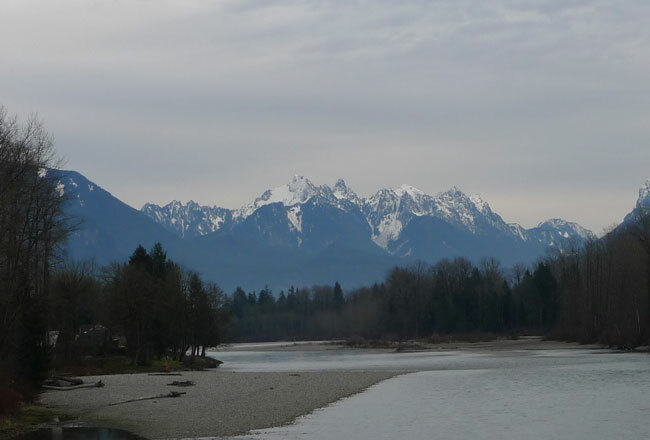 Instead of clinging to the highway, we have mapped out an alternative route, which takes in backroads and even a levee along the Skykomish River. The levee ends in a railyard in Gold Bar, but from there, it’s only a short hike back to the road. Gold Bar is the opportunity for another stop and refreshment. 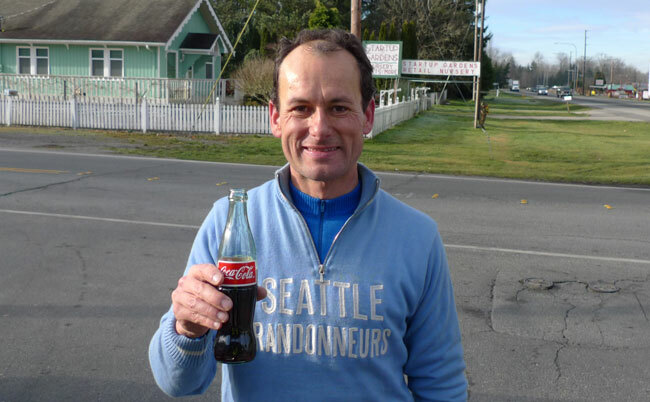 Jan’s excitement about being able to buy Coca-Cola imported from Mexico – in a real glass bottle and made with real sugar – shows that he is a “retro-grouch” at heart. Or is it just that he doesn’t like high-fructose corn syrup? 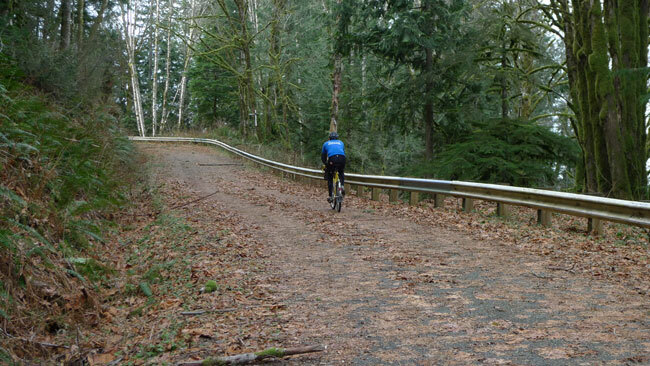 From Gold Bar, more backroads lead us to Index. Every time I approach this “wall,” the geologist in me wonders whether it is formed by a bedrock ridge, or whether it is a moraine left behind by the Cordilleran Ice Sheet advancing up the valley 15,000 years ago. The cyclist in me takes the opportunity to get out of the saddle to stretch my legs as I climb over it. Reiter Road still is closed to motorized traffic, and the winter storms have deposited a few leaves and branches on the blacktop. Having this beautiful road all to ourselves borders on magic. Finally, we reach Index. 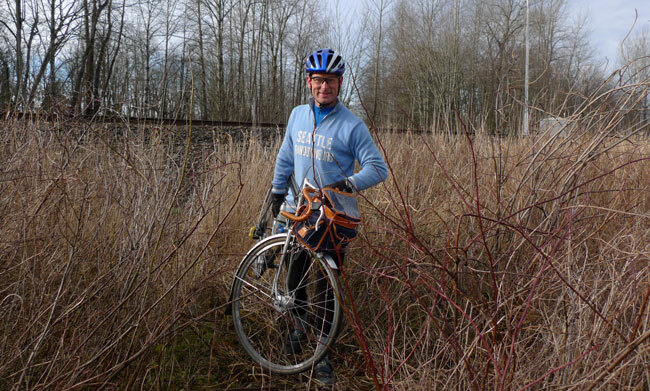 Jan eats the croissant he has carried in his handelbar bag since our stop in Snohomish. Index is a lovely spot that is bypassed by the highway and has seen better days. From here, more backroads (and a few miles on the highway) can take you to Stevens Pass and then onward to Eastern Washington, but today, Index is our turn-around point. On the way home, we get one last look at the majestic Cascade Mountains as we head back to Monroe and its Taco Truck for a very late lunch. 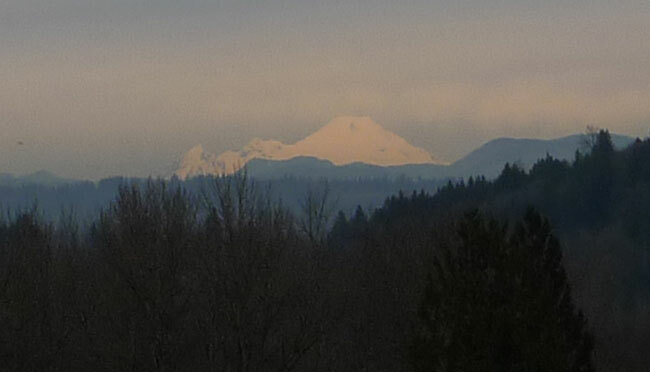 The sun is setting on Mount Baker, more than a hundred miles to the north, on this short winter day. While Jan takes this photo, Ryan spots a coyote in the field. From here, it is just two hours, mostly on the Burke-Gilman Trail, until we are home. As we part our ways, we agree that it has been a day well spent! Would you please post the route of this trip? Thanks! Any chance you could post your routes? Or are they meant to be secret? I started posting our NY-area routes on Ride With GPS last year; we currently have thirty or forty great 80- to 200-mile routes. It’s a great resource for those looking to avoid the thousands of exploratory miles needed to find the good stuff. I don’t use GPS. However, I traced a similar route in BikeRouteToaster – see http://bikeroutetoaster.com/Course.aspx?course=209510. It now truncates the end of the ride, as Reiter Road is closed for motorized traffic, but once you are there, it’s impossible to get lost. ridewithgps.com is a route mapping site, my current favorite. You do not not need to use a GPS unit to use the site, although you can upload GPS data to it. I have a GPS, but I don’t really use it. The nice thing about Ride With GPS is you can trace your route and generate a nice cue sheet. Anyway…I was mostly interested because we’ll be moving to Seattle in October. The Index Town Wall is definitely not a moraine. It is a huge solid chunk of granitic rock. In fact at the base of the “Country” or the eastern end of the wall before the trail takes you up hill there is a completely improbable iron door at the base of the cliff. Apparently this door leads to a long corridor drilled into the rock that was used by the UW at one time for physics experiments as you would be surrounded by a huge amount of granite in all directions. Also at one time the Index town wall was a granite quarry. As I understand it the capital building in Olympia was built out of rock quarried from Index. 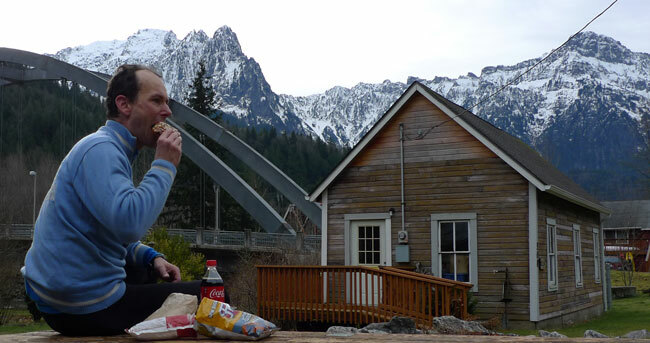 The ridge that may be a moraine actually is in the town of Gold Bar. The wall in Index is impressive. 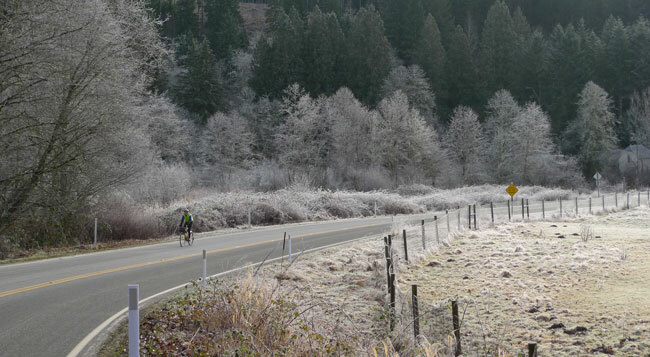 Great photo of the frost in the valley, as well as the shots of the Cascades from Index. I can’t wait to ride there in June. Awesome. Thanks for the inspiration. 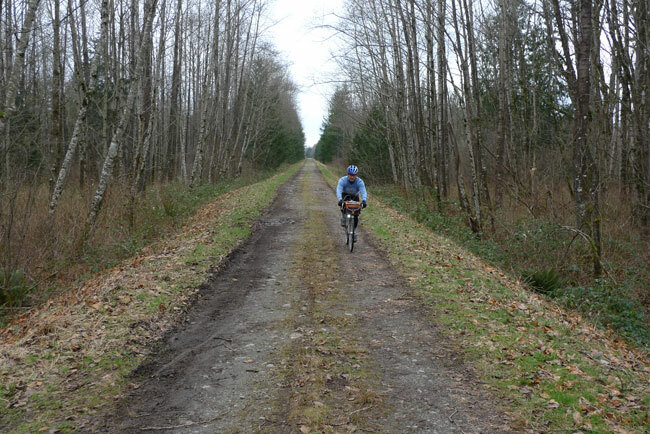 Ahh the Blue Highways and back country roads that seem to rapidly disappear quicker each and every year ( Jan’s not the only ‘ Retro Grouch ‘ here . Ditto on the hair thing as well . Snow on the roof [ grey] and falling off rapidly ) Seeing these photos makes me miss my time spent in WA ( Bellingham & Seattle ) all the more . The more photos I see of the Seattle area, the more I find myself thinking a few months of overcast cannot be all that bad. From a Chicago perspective, that much open beautiful riding country so close to a major metropolis appears incredible. One of the appeals of long-distance riding is that you can get out to beautiful places on a day’s ride. 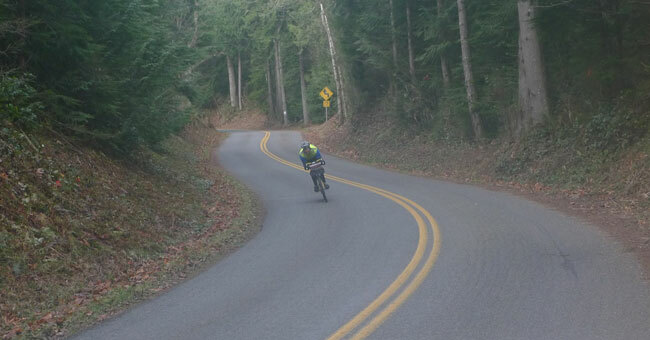 There are very nice rides within the Seattle metropolitan area, but it’s really nice to get out into the mountains and see only a handful of cars every hour. ……The rain no longer gets you down and the sunny days …… well …… beyond spectacular would be my best description . Add to that the mountains in one direction , the ocean in the other , a foreign country within a few hours drive ( BC CDN )not to mention Seattle is one heck of a city ( and IMHO Vancouver BC is even better ) well you’ve got yourself quite the lifestyle once you’ve adapted to the Rain/Soft Days and occasional OTT wind storms . I’d move back given the right opportunity . Oh and did I mention the Foodie scene ? These ride reports are my favorite posts on this blog. Keep them coming. I see that you’re signed up for the Cascade 1200k. I’m wonder if you can do a future post on your training for it. Will it be different than your training for PBP? I’m signed up also and really looking forward to it. It’ll be my first 1200k. I am looking forward to the Cascade 1200. It is a lovely course. Preparation is roughly the same as for PBP – which is described here – except a bit compressed because the Cascade 1200 is in June, not in August. I wasn’t sure if your preparation is different because the routes are so different in terms of terrain. 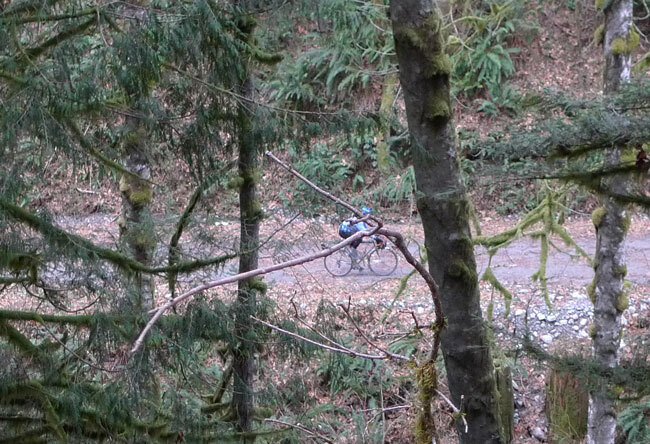 It seems the Cascade has more climbing but I’m not certain about that, I haven’t compared route profiles. Good luck with preparation. See you in June. These riding posts are so enjoyable and informative. Thanks for being so generous. Riding is what it’s all about. We only worry about geometries, fender coverage and all the other details of our bikes so we can enjoy the rides more. Nitto makes a bottle cage that holds the 355ml Mexican Coke bottles perfectly.